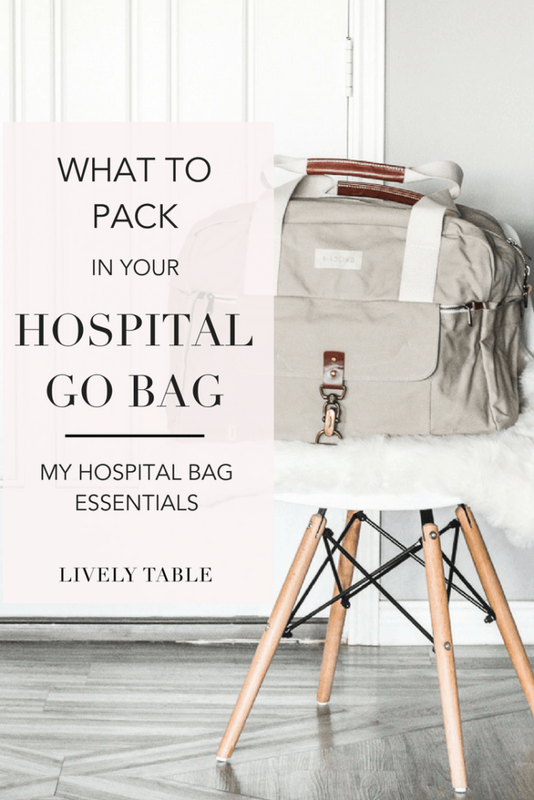 A sneak peek at what’s in my hospital bag for the birth of our first baby girl, and suggestions for what to pack in your hospital go bag when it’s time to start packing for baby’s arrival. I’m a huge planner. You might have already guessed from my meal planning tendencies, and just the fact that I’m a dietitian (99% of us are type-A). So it’s only natural than I’ve been planning my hospital go-bag for months. Now that we’re a month away from baby’s arrival, it’s time for me to actually start packing! I’m also a bit of a minimalist. While I like having things that make me comfy, I’m a pretty light packer. Our hospital has already said that they provide almost anything you need (even a diffuser and birthing balls!). So I’ve got the basics in my go-bag, plus a few luxuries that are essential to me. While I’m no expert, I do have a few suggestions from reading other blogs and websites on what to back in your hospital go bag. I have sensitive skin and I’m picky about my toiletries, so I’m bringing my own. Dry shampoo and hairbrush – I hardly ever wash my hair. I’m not about to after birthing a child. Bath towel – I’ve heard hospital ones are the worst! Disposable underwear – Not the most glamorous, but necessary. I’m not sure what our hospital provides, and I’ve heard this is the easiest option post-birth. Just in case I get hungry (highly likely) at the hospital. Bob’s Red Mill Oatmeal Cups – portable and easy for Mr. Table to fix for me! The hospital will provide all the diapers, wipes and supplies for baby, so I don’t need to bring much. A thank you gift for the nurses – They will be working hard to take care of me, so I want to thank them! These are just the things that I prefer to bring. You may also include a birth plan (my plan is to show up at the hospital and play it by ear. ), more comforts from home (robe, slippers, essential oils, speakers, etc.) and anything your hospital doesn’t provide that you think you may want. Happy packing, mamas!